Finally a beautiful weekend for our members and guests to enjoy this great club. As we began our day Saturday morning, Nick Blackwell who operates our rough unit was talking about his plans over the weekend. Monday, he and his mother and two sisters pay their respects at Jefferson Barracks National Cemetery in honor of Nick's brother Robert who was killed in Vietnam in 1972 at the age of 19. 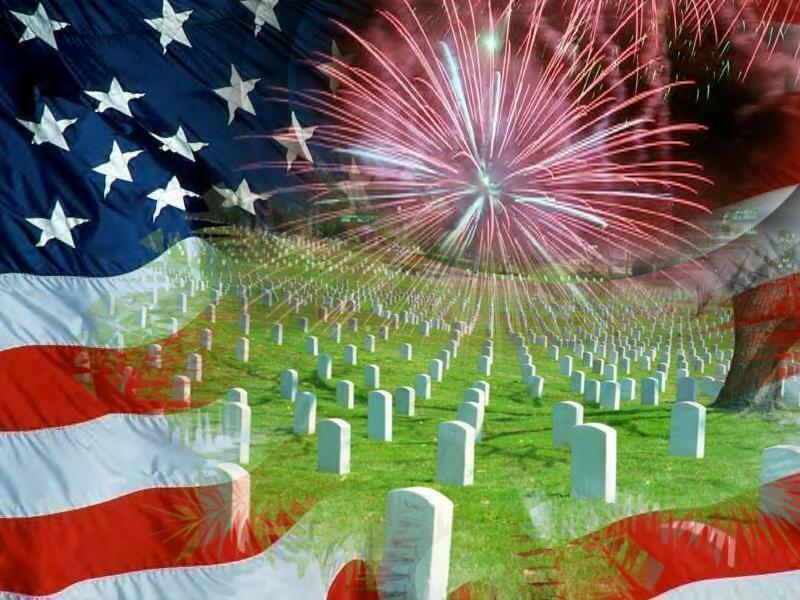 I've been lucky enough not to have lost a relative in service and don't recall anyone close to me losing a relative until Nick discussed his situation. Throughout the morning as we prepared the course, the conversation with Nick was on my mind. 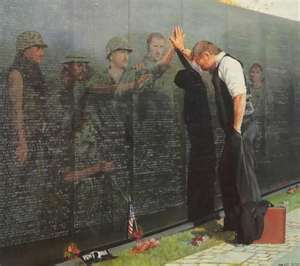 Its been 39 years ago, almost half a life but we keep Nick and his family in our thoughts as well as the many other service members and families who made the ultimate sacrifice for our country to keep us free and safe. 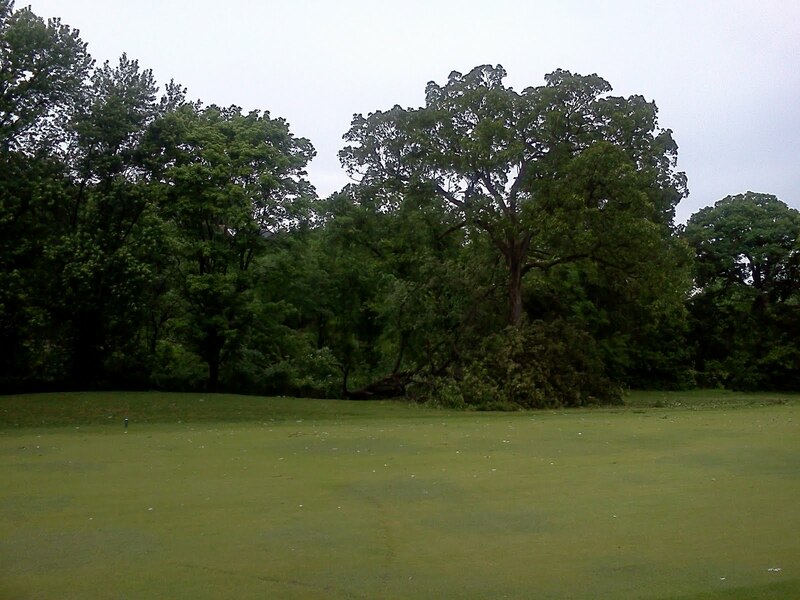 A few folks have mentioned to me about the tree on 10 that we removed the other day and were somewhat surprised. 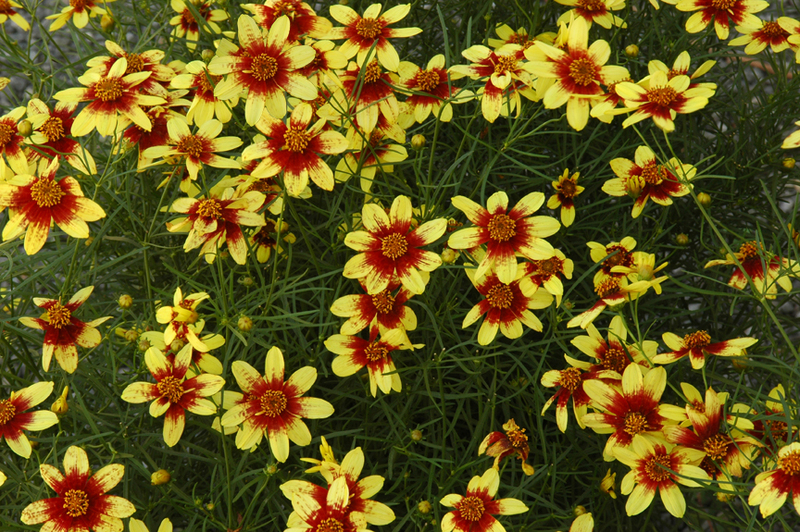 This tree has been on our watch list with the green committee over the last year. As you can see from the picture below, not much life in the tree and plenty of branches to fall off for our staff to pick up and or hit someone in the head as they walk underneath it. Removed on a wet day with plenty of staff on hand and not much mowing to be accomplished. 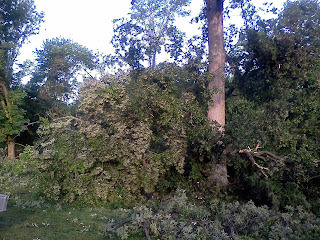 We were in tree clean up mode from the storm earlier in the week so it was an easy problem to manage. There have been a couple of trees removed from that same area over the last couple of years. 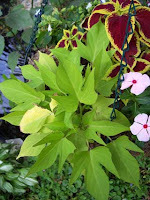 If it is decided that another tree should be put back in that area, we will evaluate the shape, size, and type of tree that will be successful in that spot and will plant it during the proper season for optimal success of survival. Removing trees in a timely manner is very important to our overall tree management program. Leaving trees standing until they are completely dead puts a serious burden on our staff due to the shear number of trees we are trying to manage and creates serious hazards for our members and guests. 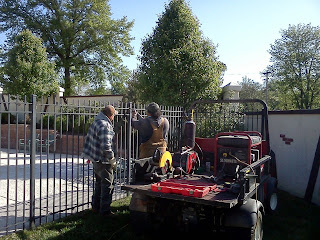 Contracted tree work runs 1-2K per day depending the type of work and equipment that must be called out to perform the task. Right now there are two very large white oaks on property that did not leaf out this spring that need to be removed along with two others that only leafed out partially. These trees are being evaluated for removal. In most cases, we will delay their removal until late fall or winter but in some cases they might require removal as soon as possible. 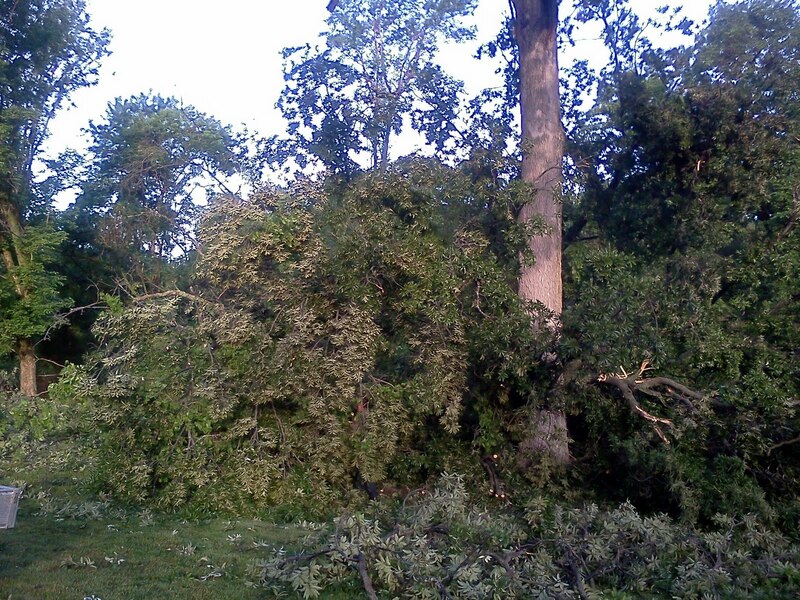 We appreciate your patience as we work through the challenges of managing our trees. The staff worked most the day yesterday cleaning up the golf course after another wind event blew through Monday afternoon. 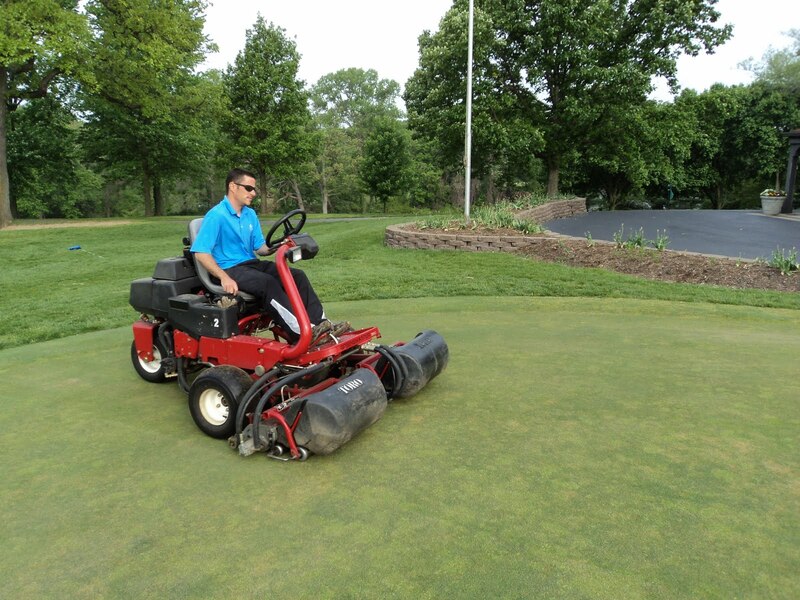 Backpack blowers were used to blow off greens and bunkers. Fairways were blown off with our large blower. Pile after pile of limbs were picked up on the course of all sizes. 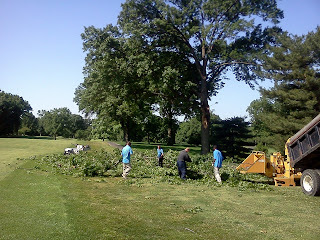 The guys made a great deal of progress of cutting up and removing the 3-4 trees that came down. The rest are being worked on as I type this message. Still some limbs that have to be picked as well in various places but we should be in fine shape for the rest of the week and holiday weekend. Jeff, Russ, Jason and Demarcus chipping brush from #4. Skip and Tom not pictured were involved as well. Nick pick up limbs all day and Tom M. blew away the material from the fairways. 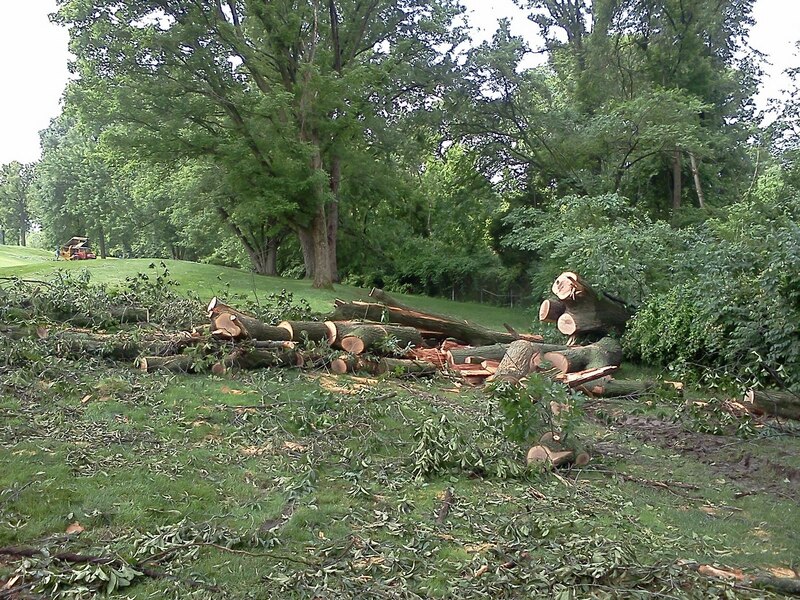 A majority of the tree that fell from the creek into the golf course was cut up yesterday, chipped and hauled away. The remaining logs are waiting for the staff this morning after our first morning jobs were completed. The chipper is in the background near #1 green preparing to chip the Silver Maple that fell through the fence line as well. 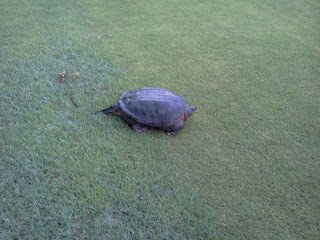 Our Snapping Turtles are on the move right now. 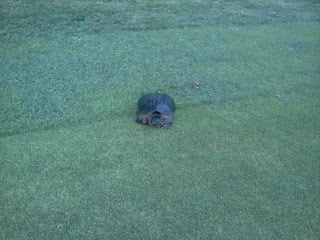 Mother's are beginning to leave the confines of our course lakes to find a place to lay their eggs. In most cases, they travel over the hill across 15, 16, 17, 18, 1, and 2 and find a nice soft and wet place along the creek in the area of 1 and 2 to lay their eggs. They are a tough and sometimes mean creature that do not like to be bothered. I was mowing greens yesterday around noon when I saw vehicles avoiding an object on the main road near the tenth tee. I figured it was some kind of wildlife but was not sure. 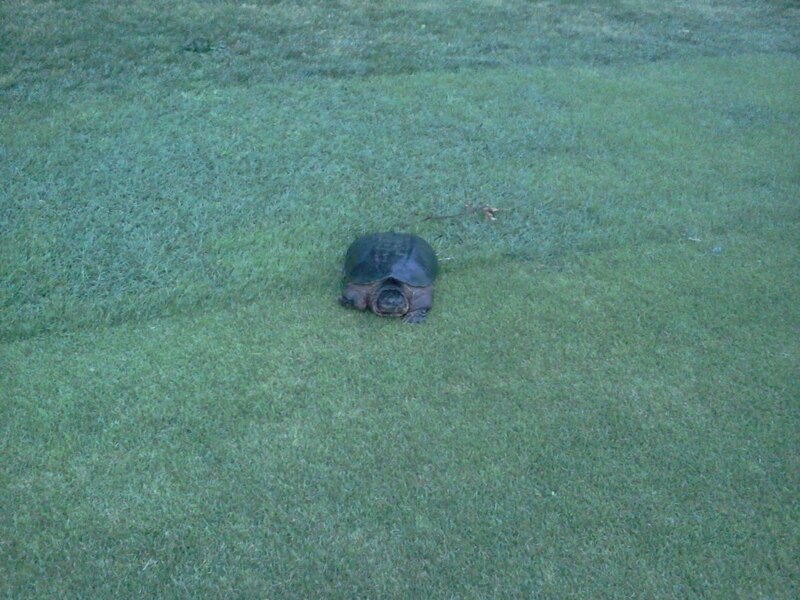 As I approached the object after mowing the 9th green, it turned toward my mower as I got closer. It was not fooling around with me. 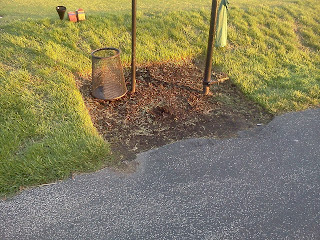 I went and picked up a bunker rake and allowed it to clamp down on the rake and I drug it off of the path. It was not happy at all. I'm not really fond of these creatures but do tolerate them on our property. If you come out in the early mornings while there is still dew on the ground, you can look for the drag lines that are about 1 foot wide through the grass where a turtle has made its path toward her egg laying grounds are back to her place in the bottom of our muddy lakes. In most cases, you will not encounter one of these creatures but if you happen to come upon one, I would just let them go their happy way. If they would be in an area of play, you could always alert the pro shop and we will move them out of the way for you to play through. This girl's shell is at least 12 inches long and probably 8-10" wide. She did not turn on me like the one yesterday, she was more interesting in getting to nesting site to deposit her eggs. 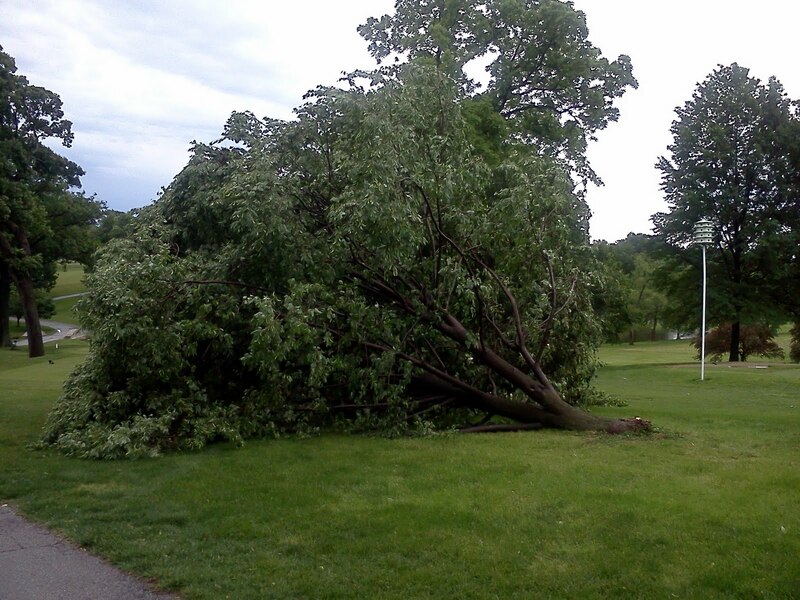 The course experienced a fairly substantial wind event today around 12:30 p.m. We've lost at least 4 trees in which 3 are in main play areas. Large limbs fell out of a couple of other trees which need to be evaluated for potential removal. Debris and limbs are down on every hole. The course will be closed on Tuesday until about 12:00 noon to allow our staff time to get the playing surfaces in reasonably good shape and to begin the removal of some of the downed trees. Little Leaf Linden behind 16 green along the road. Ironically, I had a tree service injecting insecticide into this tree just a couple of hours before the storm. Our tree service person suspected that the tree would be falling due to root girdling. His premonition was correct. A large oak that fell across the fence line onto # 1 underneath the large white oak on the right side of the hole. 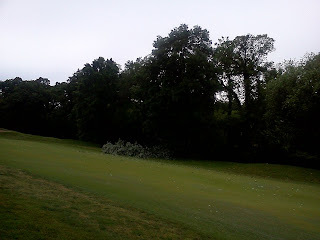 Large part of a silver maple which fell on the right side of #1 before the green. 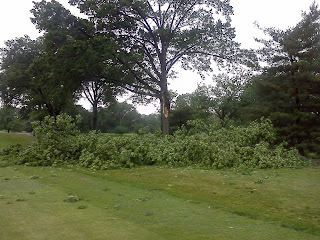 Almost 1/2 of a large pin oak on the left side of #4 that fell across the path into the fairway. This beautiful oak tree will need to be removed due to this large section falling off of the tree. It is always nice to have your course on camera. 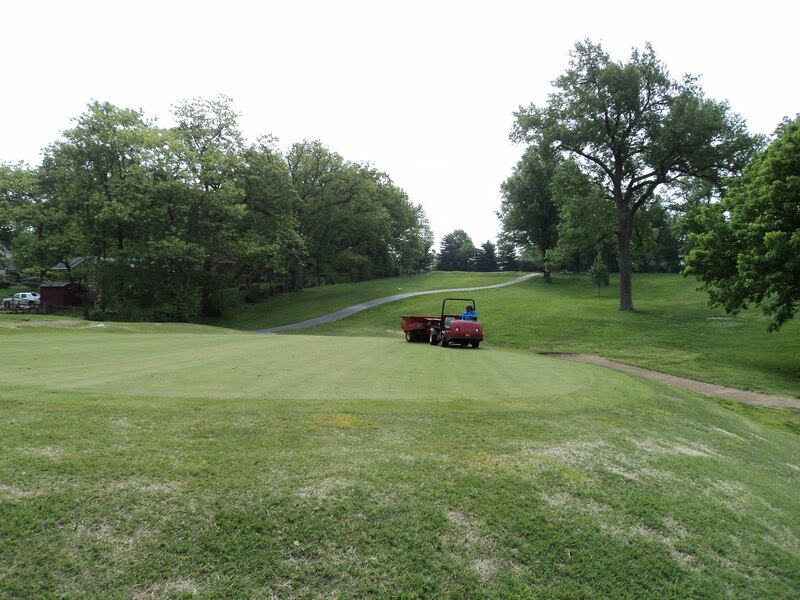 This past week, Glen Echo hosted the Missouri Women's Golf Association Senior Championship. Our club was represented well Mrs. Herrin and Mrs. Hallemann whom participated in the championship Division and placed 3rd and 9th respectively in low net. Mrs. Canter, Mrs. Gebhard and Mrs. Rosner placed first, second, and third respectively in low net. From all accounts, the ladies had a great two days of playing at our club and they enjoyed a couple of great meals and Glen Echo hospitality from our staff. Also, Mrs. Betty Chomeau being interviewed after making a hole in one on #11. Lines are being laid on court 1. Should complete by end of day if i can keep the rain away. Court 2 will be ready by early next week. .13 inches of rain this morning. 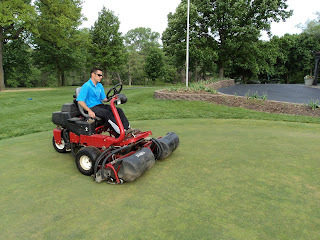 Mowing, rolling, Carts area off the paths! Tom rolling the new layer of clay. Remaining clay will be applied this afternoon. New clay layer applied today . 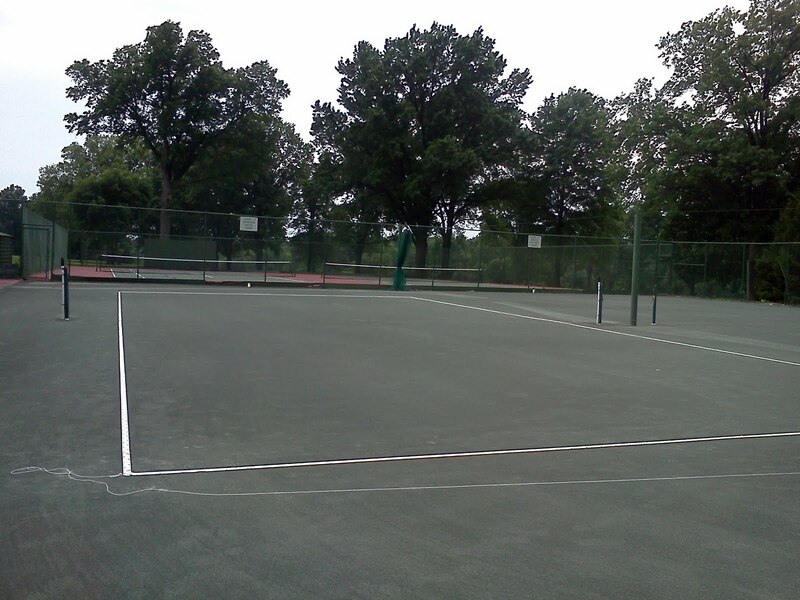 We applied the new clay layer to the tennis courts today. Some rolling and another layer applied in the next few days and we will be ready for the lines. 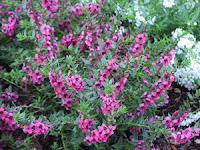 I was taking Lady for a walk around the clubhouse yesterday when she sniffed upon a Mama Mallard in one of our flower beds along the pool wall. I heard this flush of something as she dove into the Miscanthus grass and their were a large number of eggs. I chased Lady out of the spot and the Mama came chasing after us and told us to get out of there and not come back. Always love to see baby Mallards on our lakes. You can see the blue on her wing tip but she looks like the mulch as she lays in wait for her little puff ball children to arrive. the ball which improves the ball to roll true to the hole and role out when necessary. 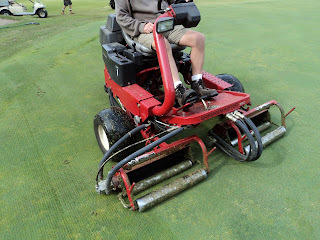 Russ using the verticutters on the greens. You can see some of the extra grass clippings created from the unit cutting some of the longer leaf blades. The greens were then topdressed with sand by Skip. Jason dragging greens with a brush. 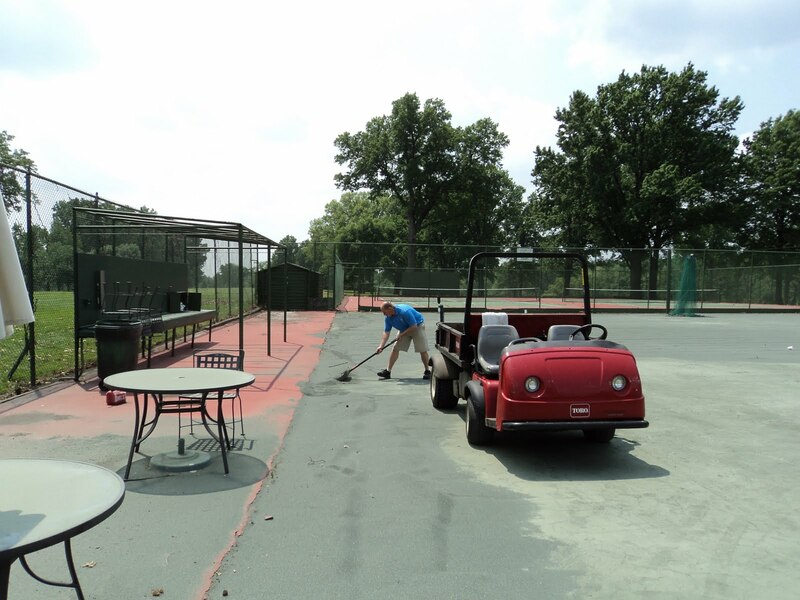 Finishing touch of mowing by Tom L.
Pulling weeds that had germinated around the court. Blowing tree debris away from the fence lines and mulching them with a rough mower. Pushing dead clay to the side of the courts. 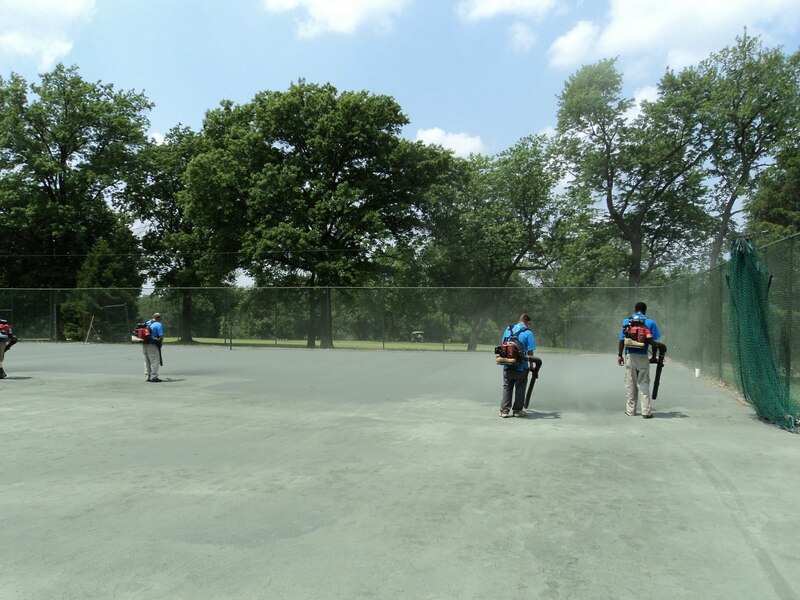 Using backpack blowers to remove the remaining clay off of the courts and picking it up with shovels and hauling it away. I began to lay some clay this afternoon with our topdressor but the mushroom cloud caused by the clay dust might have chased some of you away from Tapas night and we did not want that to happen. The last two years I used a 5' wide walking drop spreader and dispensed 200 bags of clay which was painstakingly long process. We thought we would use our topdressor this season and it appears to working well but does create a great deal of dust so we have to do this early in the morning. Once the clay is laid, we have to water it in and begin rolling it. 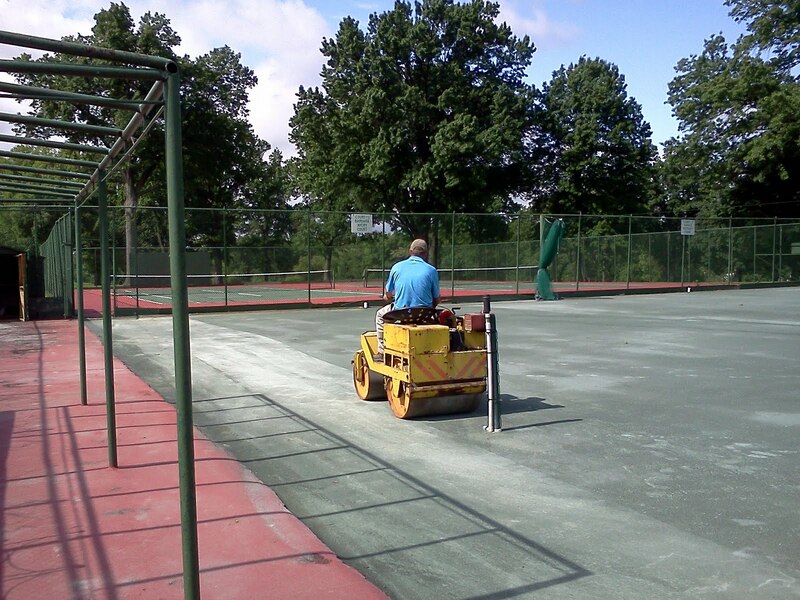 We will apply some calcium chloride to help make the surface firm and will then begin to lay out the lines on the courts. This might be the worst job because you have to nail in a few thousand aluminum nails into the tapes to hold them down. I probably need at least 3-4 dry days over the next 7 days or so to get the work completed. 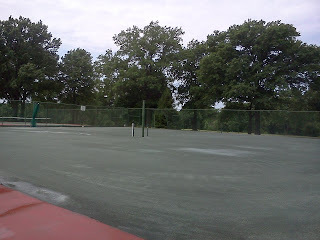 If I can get all the clay laid by the weekend, I believe we can get the courts open by mid to late next week. Jeff, Demarcus, Tom M. and Ryan blowing the dead clay from the court. Jason picking up the dead clay that was pushed and blown to the side of the court for removal. 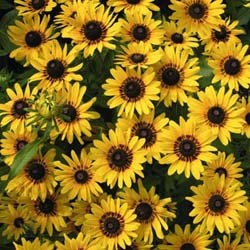 Becky has been doing some planting over the last few days. 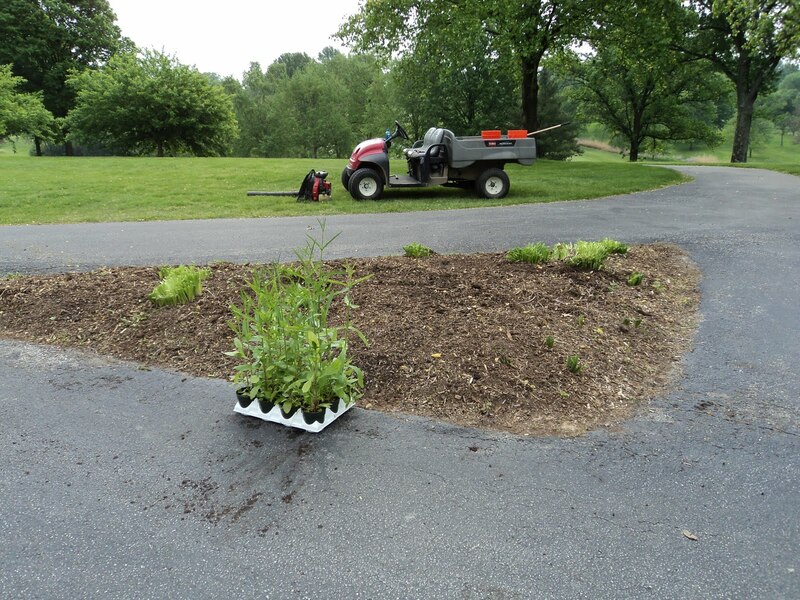 Near 16 tee is a small wedge/triangle in the path that had some perennials which were removed along with a huge clump of Miscanthus grass. 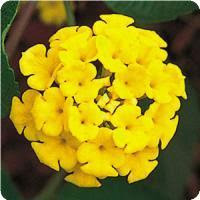 Becky has placed a nice blooming perennial in its place called verbena bonariensis. Nice upright form and will allow someone to find an errant golf ball in the middle of it. More pictures to come from some of the plantings taking place in the front of the clubhouse. 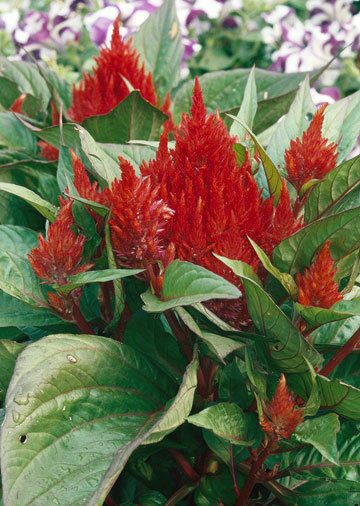 We sold over $ 1,000 of plant material this morning in our sale. 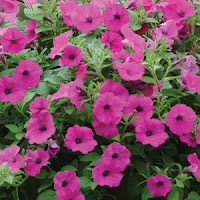 Thanks to everyone who came by to pick up some plants. If you missed the sale, I will probably have some additional material left so email me or call for an appointment to come by and make a purchase early next week. 2 days at or above 90. Above normal this season. Way above normal last season. 4.19" above normal for 2011. 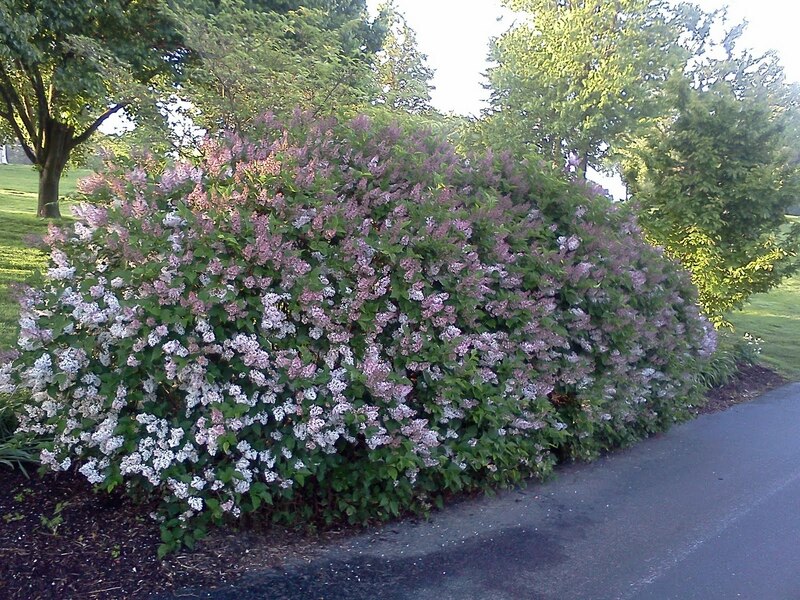 The Lilacs at the first tee are putting out their wonderful fragrance. 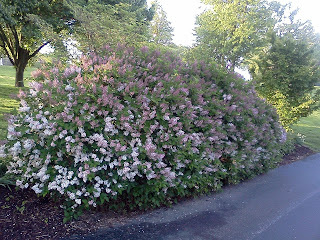 Many of the late spring shrubs are beginning to put on a display. 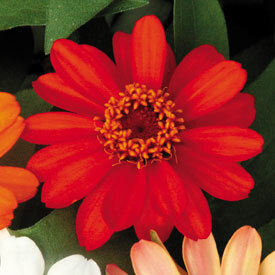 Warm weather coming next week so Becky will be busy getting plants in the ground from our greenhouse. 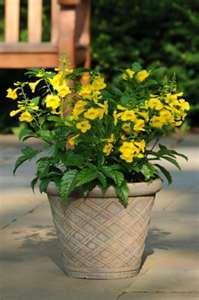 Becky is beginning to place plants in the containers in the pool area. 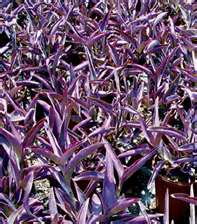 From the plant material we've brought in, she has some plants with various forms of purple. Over the past weeks, she has been painstakingly working through our ornamental beds. 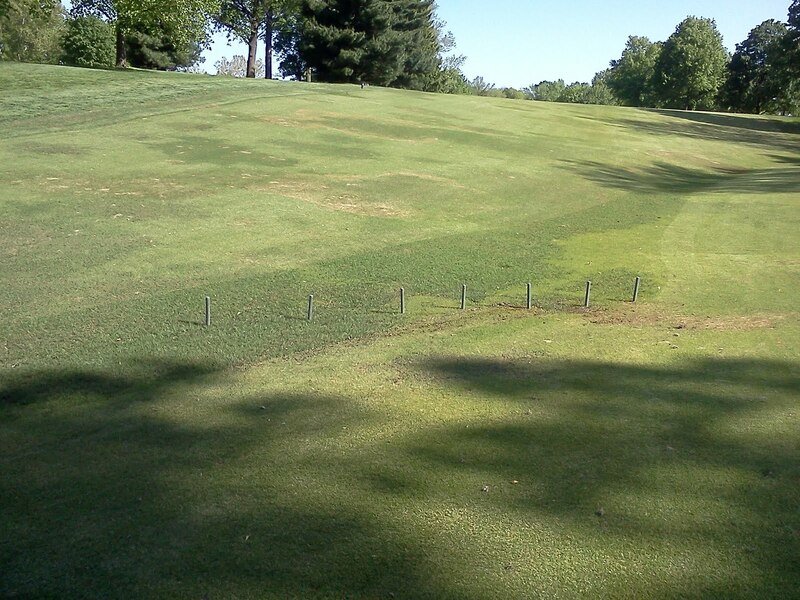 We still have one large area to work which is the plantings around the lake on #9. Becky Edwards(Staff Horticulturist) planting the containers at the pool area. 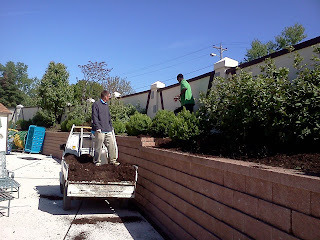 Jeff and Demarcus putting the finishing touches on the pool landscape area with a fresh layer of mulch. Under the direction of Becky(Horticulturist), the staff have been busy over the past couple of weeks cleaning and improving this area. Becky is beginning the process of placing plants in the planters. I will post pictures later. With the help of Becky, we committed to Rob that we will manage this area and give it more attention this season. We are getting dry enough for carts to drive on fairways for our members but there are still some areas that are wet and weeping water. We are using signs and some rope. We are also using stakes in smaller areas. I.E. The swale on #7. Thanks for your cooperation. 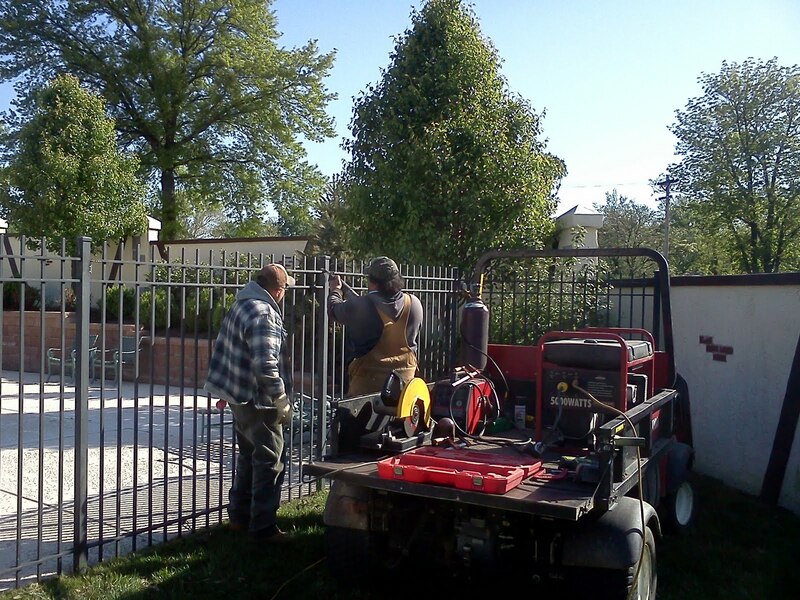 Harry and Skip cutting through the pool fence to install a hinge in section large enough for equipment to enter the area to perform major maintenance on the landscaped area. 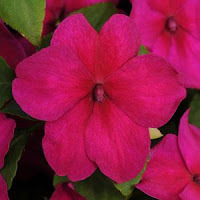 Mulching, pruning, clean up. 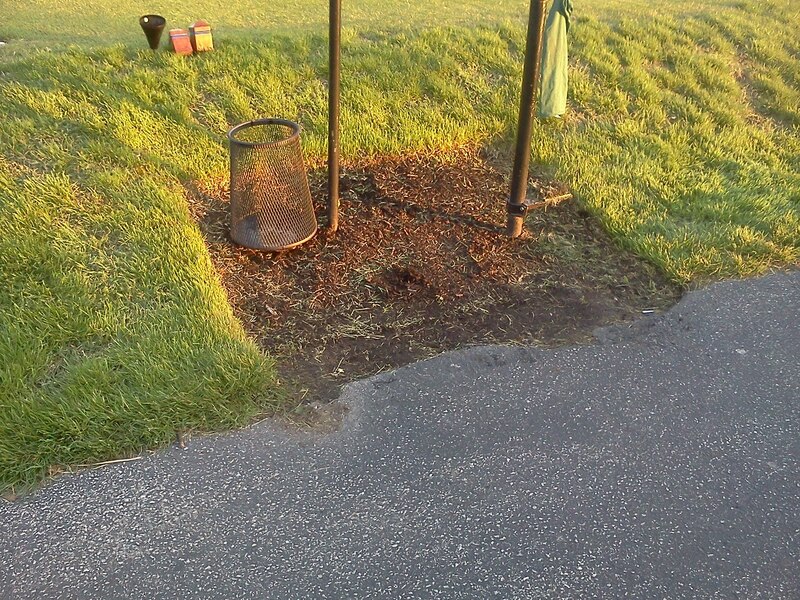 Last week, Jason and Tom removed the old mulch from the tee service area(ballwasher, trash can and bench). We intend to place a small landscape tie on the lower end of some of these areas that wash out during heavy rain events.I.E., #2 A light application of mulch will then be placed to reduce slipping and improve the overall look of the area. I was asked last season by Golf Trades Magazine to do a cover article. 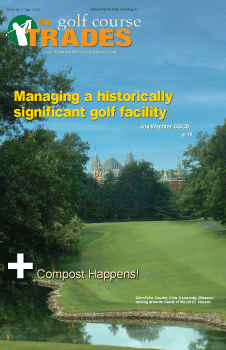 The article was just published in the May edition. It is geared for my peers in the industry but I thought I would share it with our members. 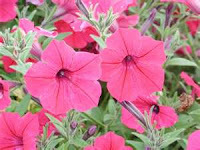 Our annual plant sale will be this Saturday from 9 a.m.until 12:00 at the maintenance building. 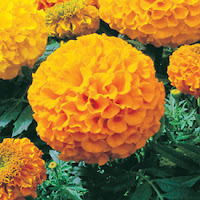 We will have various plants available for sale. 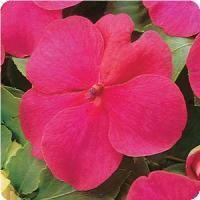 Prices will be $ 2.00 for a 6 pack and $ 4.00 for larger potted varieties. Listed below are a few of the plant selections that will be available. 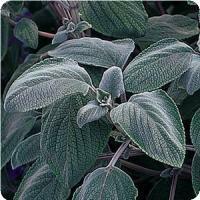 We will not have any hostas this season. 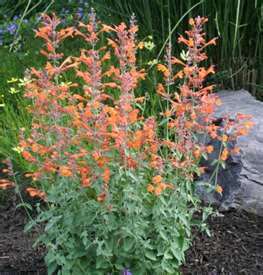 Various Coleus types and other plants not listed.